Elephants are a beloved animal. They have relationships that last a lifetime. Many researchers have documented the way that mothers and their sisters and other elephants will form a circle around smaller elephants to protect them. That maternal trait makes this the perfect gift for a mother or Mother's Day gift. It's also possible that a woman will love animal rings, earrings and pins just because they are beautiful. Please take a look at the beautiful jewelry below. I'm sure that you'll find the perfect one for yourself or a friend. There is something very special about elephants. It could be the fact that something so large is, well, so cuddly. Who can resist the way an elephant's trunk curls and the way they walk so gently. Of course every woman loves the way all of the female elephants will work together to protect a baby elephant. On a glitzier note, elephants and their harnesses look beautiful as they perform tricks under the Big Top. So many of the jewelry pieces have the elephant adorned in beautiful costumes made in gemstones. Other elephant jewelry pieces make the most of the elephant's shape and personality. 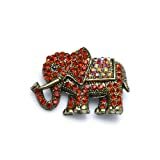 The ruby red crystal elephant pin shown above is a great example of a colorful elephant pin that will remind you of your circus visits. You can decide how much sparkle and bling you want on your elephant jewelry. Take a look at the right and you'll see that one elephant pendant is completely covered in clear topaz crystals. The elephant necklace below is a pink enamel necklace with just touches of diamond accents. Elephant necklaces and jewelry are what I like to think of as conversation pieces. When I wear a piece of elephant jewelry or a snake ring, almost always someone will comment on it. I have to admit that I can be a bit shy at parties where I don't know too many people. But if I wear some interesting piece of jewelry, I always have a witty rejoinder to a compliment about it. That way I can get a conversation started. The following three pieces show just how divers elephant jewelry can be. 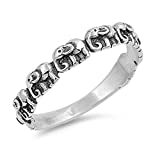 The two-tone band ring shows silver elephants walking tail to trunk.The multi-colored elephants have amber stones as their bodies creating free form elephants. The sophisticated earrings show an elephant with a white pearl body. Pins are my favorite form of elephant jewelry. My fashion style is classic and as a result I have a navy coat, a long black jacket, and red pea coat as my basic outwear during the winter. I like to add a little pizzazz with big and bold pins. Sometimes I use the pins to keep a scarf in place. Decorative elephant pins with lots of crystal or brightly colored enamel are just the kind of lapel or coat pin that I often look for. Each of the lapel pins shown to the right will look fantastic with a wide variety of colors and styles of coat. If you teach elementary school, I don't have to tell you how much small children love brightly colored jewelry. The same thing goes for older residents in nursing homes. They look forward to having something to talk about and when they see a unique piece of jewelry, they can comment on it and start a conversation. Beginning from the mouth to the tail everything about this elephant is cute. 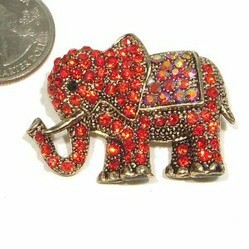 The Synthetic Sapphire crystal rhinestone elephant pin brooch is a must-have item for ladies. This cute design of an elephant is made on gold toned alloy metal and covered with light Synthetic Siam crystal rhinestones. Elephants are known for protecting their young. Everyone has watched in awe as female elephants form a protective circle around their baby elephants. It's a true form of female bonding as aunts and cousins join with the mothers. 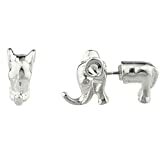 Therefore if you have a close friend that just had a baby, a mother and baby elephant pin is a wonderful way of saying that you'll always be there to help. You probably know I'm a huge animal fan from my pages. This Elephant jewelry is just gorgeous. Love those pins. Heart Diamond Rings just scream romance! Melt HER heart in the most special way when you give her a Heart Diamond Ring. A Claddagh ring with a diamond fuses the Irish tradition of honor and loyalty with the Western tradition of love.